On the most basic level Ghatak imbues the car with a riotous personality that comes to symbolise wider ideas including that of technology, the machine age and above all, rapid modernisation. Such are the affections Bimal harbours for his battered Chevrolet, his presence and existence becomes defined by an innate attachment. One could definitely label this as a road movie, with Bimal’s episodic journey across the plains of the Ganges delta providing some illuminating compositions of rural landscapes. However, it is the observation of the Oraons tribe through the elaborate dance rituals that offers a glimpse of Ghatak’s personal ethnographic fascination with marginalised cultures and people – a preoccupation underlined in an article titled ‘About Oraons: (Chotonagpur)’ written in 1955 by Ghatak and a short ‘preparatory test film’ which he shot whilst filming ‘Ajantrik’. He had hoped to make a film on the ‘life of the Adivasis of Ranchi region and on the Oraons of Rani Khatanga village’ but this like many other ideas were never realised due to financial difficulties and an uncompromising approach. 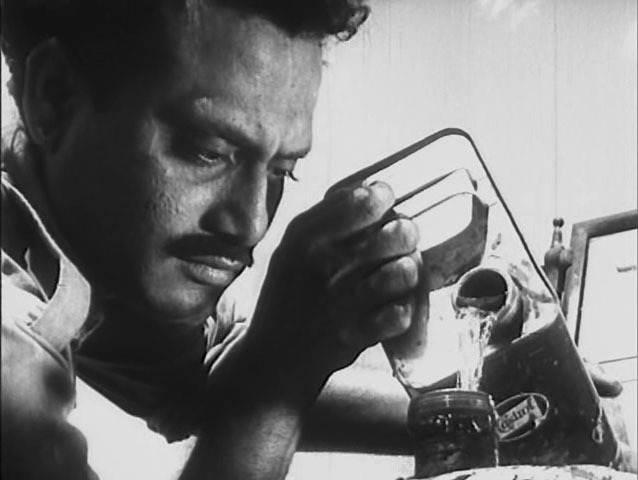 This entry was posted on October 20, 2014 by Omar Ahmed in Indian CInema and tagged Bengali cinema, Indian Cinema, Melodrama, Ritwik Ghatak, Science Fiction.